Don’t hate me! It’s been over a week since my last post and I feel horrible about it! Trust me though, I have a good excuse. As you all know, I took part in the NBI monthly challenges and when it came to the “Learn Something Challenge” I took on the task of attempting two things. 1.) rolling a mage and playing it to level 20 and 2.) I made the crazy decision to make some audio warlock segments to submit to several of the larger WoW podcasts. Well, as you would have guessed, the mage still sits at level 9. I know 11 levels to get to level 20 isn’t difficult to accomplish and I can probably Fireball spam my way there in a few hours. However, doing this audio stuff is quite tough and has soaked up a major time commitment. Let me warn you that most of this post is not about warlocks. Instead it’s a warlock ranting in frustration over setting a goal that is more daunting than I bargained. Audio equipment and music isn’t completely new to me. I’m a drummer and bass guitar player IRL have played in bands since I have been a teenager. I’ve run everything from PA systems to compressors, and from power heads to even mic’ing my drum kit. Btw, for the music equipment fans I’m down to one – 7 piece red mahogany wood Sonar kit with all Zildjian cymbals and I’ve dropped my bass collection down to one red and yellow clear wood stained Fender Deluxe with active electronics (great for slapping & popping!) and one Fender Silver Anniversary P-Bass Special (great for bringing some bottom end!). As you can see I’m a warlock with an affinity for Fender. When I originally came up with the concept of the warlock audio segments I thought, “Hrm, this won’t be too hard. I’ll just use my computer headset for my microphone, grab an audio program to use, then I’d hit record and just run with it.” WRONG! Omg! Working and layering waveforms is a completely different animal than working with live audio equipment. For live sound you simply set everything up, hit the power button, tweak your sound and it’s a set-it and forget-it type of situation. If you ever played music in a large hall, or bar :) you might have to tweak some of your volumes and settings based on the crowd sizes. Believe it or not once the acoustic space fills with bodies it can dramatically change the sound as the bodies of the audience absorb the sound waves; as compared to simply bouncing around off of walls. When you’re doing live sound or music you can flub things and most people will not notice mistakes. Multi-layering sound waves is a completely different which has amazed me. Think of a soundwave as a single computer file. You load the sound file or files into a multi-track recorder or computer program and you can change and manipulate each sound individually. The editing part sounds easy which is adding all of your sound files and layering them on top of one another in a correct order or flow. When you finally export and record what you have configured it comes across as one seemless sound file such as a podcast or song. Yes, I know these concepts might be basic to some, but for those that don’t know I want them to understand the concepts before I move on. The time-sink came when I went to look for public domain sound files and music. As much as I would love to use a song like Joan Jett’s Bad Reputation for my warlock segment’s background music I can’t do that ethically or legally because of copyright laws. For several nights I spent hours not only grabbing Public Domain background music, but also a ton of sound effects that I may want to use in a segment as well. The next-big time sink came when I tried many failed attempts at layering my sound files and learning how use the Audacity program to accomplish audio editing. Three evenings spent and I was still at the rudimentary stage. In my mind and imagination, my original intention was to make an upbeat and fast pace warlock segment. 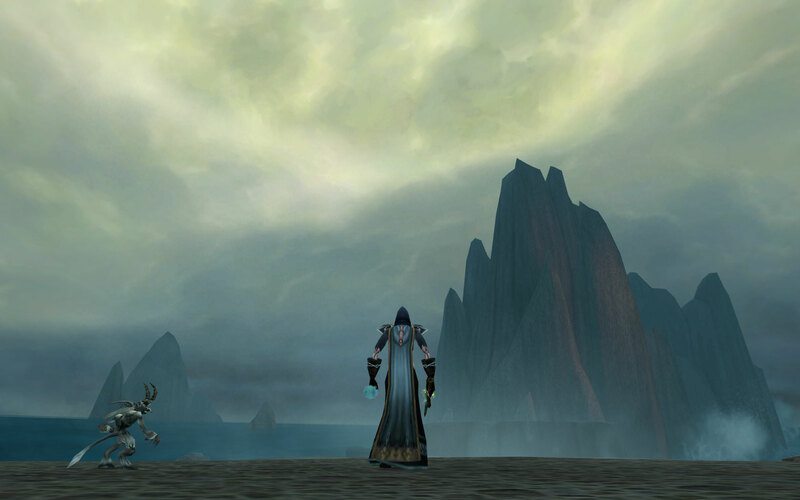 I wanted something that was like the smart-alec tone I try to pull off when writing through my WoW character, Amijade, on this blog. I knew that I wanted to include the sounds from one of the demons, and I wanted to make it fun. My plan was this: toss in a few snarky remarks, mix in a few of the new MoP warlock Beta features, and then it would be done…or so I thought. Ugh! Next was trying to give Amijade, her own voice sound style. Since I’m a guy IRL, I knew there was no way for me to imitate sounding like a female, Undead or not. My first options were that I could change the pitch of my voice using the audio program or I could find a female voice actor to read the script and lines for me. So, I spent the rest of that night trying to change the sound pitch of my voice, but it always gave me that “Gnome-chipmunk-on-helium-squeal” kind of annoying flavor. I don’t know any female voice actors so that left me with two clear choices: Beg my wife or beg my daughter. When I went downstairs to plead to the lovely women of my life to help me in my dire need, I knew instantly it wasn’t going to happen. They were watching, The Notebook. Psh! 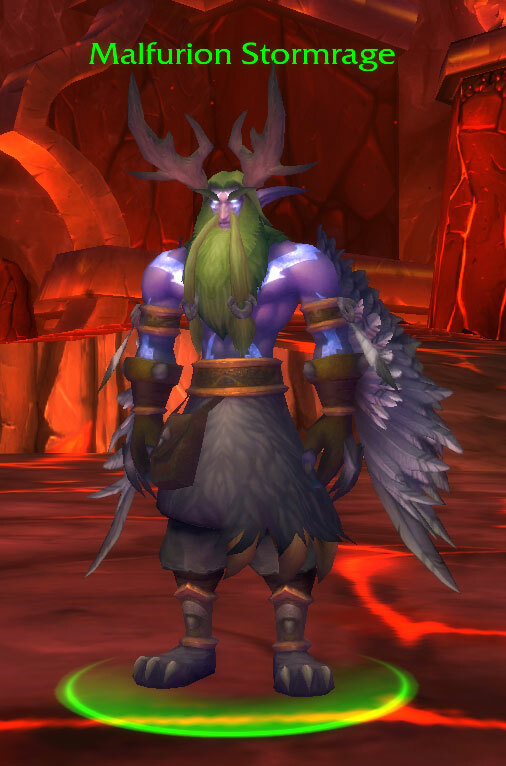 Even after finally convincing them to pause the movie long enough for me to explain that what I was doing was important “For Science!” they both looked at me like I had Malfurion’s antlers cropping outta my head. Both laughed hysterically as my wife pressed the DVD player’s resume button and then they both put me on ignore. I took a quick mental note of my rejection so I wouldn’t forget that moment, and when the timing was right I would remind them how they failed me. Guilt is a great way to gain leverage, trust me on that one. So, Amijade was going to have to live with my using my voice set at a pitch about 3 keys higher. Anything above the 3 key pitch range was bad, and anything below 3 keys dropping back down to normal was worse. Yep, this is how I felt – not the cool Malfurion but the chicken-deer variety! I’m sure hating one’s own voice is common and typical of self-loathing. It’s probably up there with many of the common fears like speaking in public, arachnophobia, or playing a Gnome mage. It’s amazing to me how much different we hear ourselves inside our own skulls as compared to how others hear us. With our ears on opposing sides and having our heads being somewhat hallow due to our ears, nose and throat – hearing yourself clearly and unfiltered really is horrible. I am far from having a radio quality voice and hearing myself reminded starkly me of why I should keep my day job. I spent my evenings this past weekend working on editing and combining all the clips. I put them all together and made a 2 minute warlock segment. Sadly, due to the limitations of WordPress.com I cannot list audio files on my blog unless I pay a higher yearly fee. Hrm, this was something I just learned after having tried to upload them. Since I only have two versions of my sound clips to present I’m debating on paying the higher price for you to hear. If these clips had turned out close to how I imagined them, then I’d be forking over my card number now and you would be clicking on the link to hear it. I emailed my warlock segment to a famous WoW Podcaster asking him for his advice. I won’t point fingers or give away his name so as to save him from embarrassment. We eventually hooked up on Skype and had a great discussion about it. He was actually going to put the segment on his show if I gave him the green light. Omg Wut!? Oh Noes! This was my screwing-around-just to see if I could do it version. If he was serious about putting me on his show, I was going to redo everything. One of his only criticisms was that he suggested I use my real voice. Ugh…I completely dread that idea. So, now I’m debating on what I should do. What do you think I should do? Go for the campy weird voice where I can act a little on the nutty side but it doesn’t sound as good, or should I use my voice and play it straight and simple? I’d love to hear what you think! I think the whole idea sounds pretty awesome, and I look forward to hearing the end result! Sadly I can’t help you in regards to what you should do, because I know nothing of such things. I’m pretty sure either would be fun to listen to, so maybe just go with what you feel most comfortable with? BTW, update on Tmog contest; 2 entrants as of today! Woot I got two! Thanks for the boost of confidence and if you have ever heard a radio announcement or a podcast segment break then yes, you do know of such things :P No worries though, I’ll keep you posted on what I decide. This was fascinating to read! I only have a small bit of experience with audio recording and editing (video is my thing). It sounds like quite the learning curve! I appreciate your suggestion. Hrm…we shall see. I’m just a little sad I can’t post them on the site. All that hard work and no one can hear them! Thanks again. It sounds like the current clip is one that you think is funnier than what you’ll be able to achieve if you redo it, but you’re not happy with it. It’s tough to say if you’re being overly critical or not (I know I tend to criticize myself harsher than others will) so I’d go with: if you think you could learn something from redoing it and would enjoy redoing it – redo it. Then submit both and see which one the podcaster would like to use. A week or two won’t hurt. If you can’t guilt them into making clips for you, I’ll help! I have the mic on my headset, so just point me in the direction of a recording program and tell me what to say. I’m female, so at least you won’t have the helium sound to deal with. I’ve been told I have a nice phone voice … which I’m going to hope is a compliment. Aw, thank you very much for offering. Okay, I’ll make you this promise. If I ever decide to add a succubus voice I’ll hit you up for it! The problem is consistency. I need to try to make the segments to where they can be changed easily with a quick voice over. Otherwise, I don’t think I could be consistent with a weekly follow up. So my thought is keep the same opening and closing and just add the middle stuff with VO work. Now, I’m curious to what your voice sounds like! 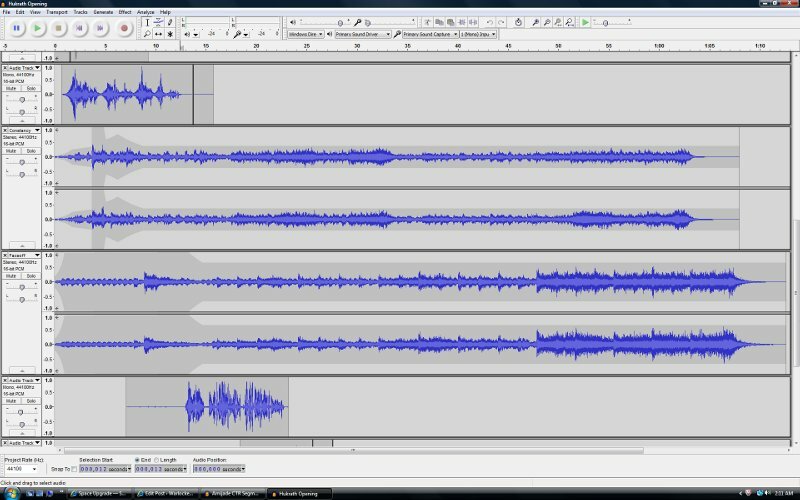 Download Audacity, record a few lines. Go to File and Export then make sure you select Mp3 and mail it to me. The whip sounds of a succubus are optional! I think I’d go with whatever you’re more comfortable with, you could try your next one in your own voice and see which you’re happiest with. And I see Prinnie is available to help too and I bet her Mechalis does a great Warlock voice! Yep, I agree on the comfortable choice. All you can do is try right? Now, I’m just kicking myself for even considering it. Don’t get me wrong I’m having fun learning about all this but not in hearing myself! Bah! Go with whatever you’re happiest with. That is always the best path in the long run. Good advice and don’t you think life should always be simple like that? I can see it now, “Honey, I don’t want to go to see your family. I’m happiest if I don’t go.” *SMACK SOUND* followed by me dragging myself to our car. Ha! I appreciate the advice though. On the topic of your own voice, I assume the famous podcaster heard your dulcet tones on skype and still suggested that as an option? Just because you don’t like your voice doesn’t mean it’s not awesome sounding to the rest of us. At the end of the day though, unlike visiting the in-laws, this is about you and whatever you’re comfortable with the rest of us listening to. Yep good point. I think it really is about my own comfort level. I’m not always a perfectionist but I don’t want to be boring, I don’t want it to be dumb and I don’t want it to sound bad. I’ll never achieve perfection, but I would like it to be something worth listening to… :P After you make some clips, please let me know what you think of hearing yourself. It’s quite a surreal feeling for me. From someone who had 8 years in radio…I hate my voice too. Actually, I still do (and yet I make others and myself suffer by grabbing the mic in Rock Band now and again). Not sure about Audacity, but I always found Cool Edit Pro to be the easiest program in the world to work with. Also, take a look around at copyright detail and what have you. You’re allowed a certain time frame of a clip (varies from country to country), and if you actually bought and own the CD/track, I think there’s a variable there as well. This is exacerbated by the fact you’re not using it for profit, merely as a hobby. You’re also not making the track itself available for others. Again, it’s been a bit since I researched the legal matters, but there is some wiggle room (at least in Canada). Thanks for the advice! Yep I found a great site with some nice background music and the author allows you to use for free as long as you credit him in the clip on details or post on a website. Very nice! I’ll have to look into Cool Edit Pro and so far Audacity isn’t that bad other than I’m running hot and clipping everything. I’ve changed everything to bring the line in volume down and it either shuts the line down completely or runs hot. Hrm, more stuff to learn I suppose :) Also, thanks for the tip on the the copyright stuff – I’m going to have to read more on it. *Sighs* so much to do so little time! Thanks for stopping by! No worries! You’re on my blogroll, so I pop by more than you might think based on a lack of commenting, lol. The hot issue could be anything from port to program to microphone. Hopefully you get it figured out. Another option would be to snag a reasonably cheap digital recorder and just do a file transfer. Might be “great lengths” for what you’re looking to do, but it’s something to consider. Well I sure appreciate that you stop by and no worries, I followed a lot of blogs for years and never commented much as well. I’ve decided to change that and I’ve become more vocal now. It’s hard to come out of a shell sometimes. I think my problem is my headset itself. I’m going to purchase a new one and see if it’s the culprit. It will also depend on how serious or committed I become to a project like this…right now, since I’m such a noob I’m goin to stick with the basics and get my feet wet. I appreciate the advice and tips! I am curious to hear and wonder what your personal favourite is when you’re done fiddling :) Though all of what you’re writing about with sound editing is way to hard for my simple cow brain, the bit that I DID understand sounds so cool! Not sure if I have a personal favorite but I love the way my Voidwalker sounds now. I think I got the sound effects tweaked enough to where it is pretty darn close. Well it’s close enough to where I’m happy with it. I think my favorite is the music I have selected. I found a good resource for background music and the author is letting me use his work. Now I just have to decide on which one. They both have a mysterious flavor to them and they sound like a Danny Elfman “style” of music and composing. I’ll date myself, but I saw Oingo Boingo back in ’86 or ’87 and got to meet them after their show. It was pretty cool because they became so big later on, and of course Mr. Elfman has done so much work for movies and TV. If only I had a cell phone that took pics back then! The only thing I can really recall is that they rocked the house and didn’t slow down once the entire night and all were very nice to meet. No airs about them at all.